Charlie R. Hale is an acclaimed anthropologist and the new SAGE Sara Miller McCune Dean of Social Sciences at UCSB. In 1977, he began what would become four decades of research and practical work with people seeking to better their lives through economic, political, and cultural empowerment, first in Bolivia (77-81), then Nicaragua (81-90), Guatemala (94-2002), Honduras (2003-04), and Southern Mexico (2008-2017). 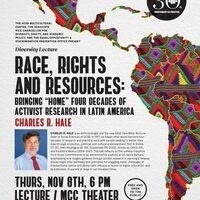 This talk reflects on the unlikely transition from those commitments to an administrative position at UC Santa Barbara, emphasizing how insights gleaned through activist research in seemingly faraway places might offer pathways and principles for engaging major challenges of intersectional justice and democratic efficacy at home—in higher education, and by extension, in society at large in our troubled times.